Ramsey’s Goofball has become one of our favorite fly patterns for 2013. The Goofball is a great general attractor, and it can imitate numerous insects. This Winter/Spring we used a green Goofball for a Cicada in New Zealand. In April we used the same green version for the McKenzie Caddis on both the McKenzie and Middle Fork of the Willamette. In May and June the Orange and Yellow versions are excellent patterns on the Deschutes for salmon fly, and golden stone imitations. Throughout the summer the Goofball is an excellent hopper dropper dry fly. 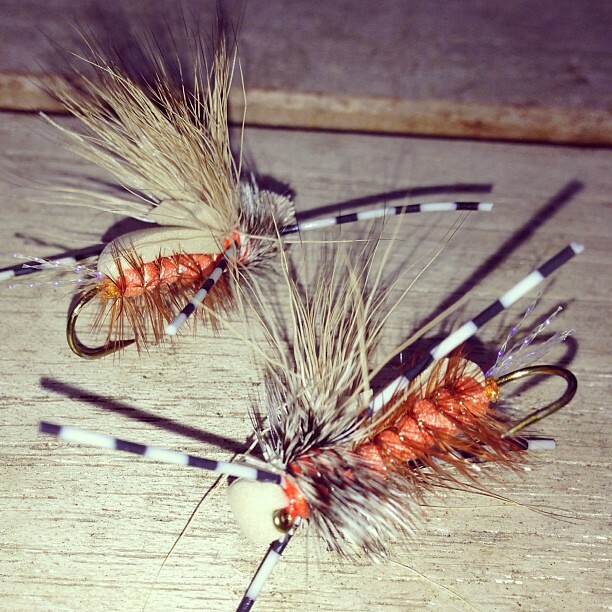 As we move closer to the Fall I look forward to using this version for an October Caddis imitator. The tan version is an excellent pattern for a short winged stonefly. Matt Ramsey, creator of the Goofball and other killer fly patterns like, Husker Du, Pan Fish Spider, Chernobyl Squirrel and Mouseketeer resides in Eugene and guides locally and afar in Mongolia. Matt stopped by to tie the fly. We made two videos, one without sound and sped up, and one with a full explanation of each step. Enjoy. tie it up on #4 or #6, then riffle hitch and skate it for steelhead maybe? It skates fine w/o the riffle hitch. Try it out.